I didn’t have high hopes for my second Open Door, my first went terribly, even I wouldn’t have been impressed with me if I was a parent. So with my second Open Door, I was a little nervous about. I had it at 9am so at least I didn’t have to wait all day for it. My two students, age 6 or 7 (forget) are usually great in class. And they didn’t disappoint. One students Mum was there, with the other students sister. This time round I was more prepared. I had my flashcards ready, had my topics ready, activities that I was going to use all prepared and I knew what I was going to do. I have to say, I was SO proud of my students. They done great. Everything we done in class I reviewed with them. Open doors are usually when you show the parents what you taught them, a review class. (My first OD was NOT like this at all). The students actually talked English, and they were really showing off what they knew. They weren’t shy and they done everything that I asked. I was so happy with them that I gave them 2 sweets after class! One of the students forgot a few vocab so I had to remind her, while the other one was helping her, making sure her Mum knew how good she was at English. Because this class lasted an hour and half, after 45 minutes the parent and sister left, so I continued with the lesson. We had a quick 5 minute discussion with them afterwards and they seemed pleased, with the only thing I need to pay attention to is the students speaking Chinese during class. I’m more prepared with my future Open Doors, where I have the feeling my next one is with one of my lesser favourite students. I feel as if I am teaching her nothing, because she is either tired, hungry, too lazy or doesn’t want to be there. Personally I think it’s all four. I also have a new student on a Saturday for 1 hour. She used to be with a group but her Mum wants her to practice more oral English so she is now just with me. The first day she was a little shy with me but I think she will be a very good student. She seems really nice. I love when you get students that are just great students and you don’t mind teaching them. That’s half the battle. My worst class is the babies…. Oh my god I’m going crazy with them. I have one group aged 4 and it is a real challenge. It used to be 2 girls but one left because the parents thought she was too young. Now there is a boy and girl. And lucky for me, they don’t get along. Typically, the boy likes playing with cars, while the girl prefers to play with cakes and girly things. The girl has in fact become sadder since the boy arrived. Its hard to see. I have no idea what I’m going to do with them. I am literally stressed with them because they keep fighting and don’t share. Then the girl just sits on the chair and doesn’t want to do anything because she doesn’t want to play with the boy. The only time they do get along is when the boy starts singing a Chinese song and she starts singing with him. Then I CAN’T teach them anything because they are too busy singing. To top it off, the boy’s granny has to sit inside the classroom because he starts to cry. So I have HER looking at me during the catastrophic class. It really is bad. I know I can ask to move the class to another teacher if I feel like I can’t handle them, but I’ll persevere until I feel that I can do no more. It’s just obvious that the students just don’t mix and they shouldn’t be in the class together. So hopefully my future open doors will go smoothly, and my babies will cop themselves on and start being good, or I’ll package them up and ship them to another unfortunate teachers soul. Well I finally had my first open door with one of my groups. I was praying the PA’s would forget about them and I wouldn’t have to do them. But no, unfortunately they didn’t. Usually every 15 classes the group there would be an Open Door. The parents come in and watch 45 minutes of the class. Then there is a discussion about the class and what the expectations are from the parents. During the week I was gradually getting a little more nervous of the prospect. This particular class is very quiet. I have 2 girls and one of them is very quiet, whereas the other is a little better but it’s obvious she doesn’t want to be there and it’s hard to get her to co-operate. Oh, and they are also 5 years old. Well my praying to my angels didn’t help. The open door didn’t go very well. The more active girl started bawling so that took up 10 minutes with her Dad trying to get her to calm down. Then they both wouldn’t do anything for me. I would say “RUN TO THE…. GREEN CHAIR!” and they would slowly walk to it. Then for a game I decided to get them to ask “How many heads/eyes/ears… do you want?”….. Then the student would have to draw how many they said, so they have a picture of themselves, say with 10 heads and 5 legs. But because I couldn’t get a word out of them, the game went extremely slow… taking 45 minutes. I know I should have stopped the game and moved onto something else, but I suppose I was under-pressure and just didn’t think. So that meant the parents didn’t see much from the students. The parents then left and I taught the students for the remainder of the class. Miraculously, they started talking English when the parents left. After came the meeting. My PA discussed with the parents while I just, well sat there. They were speaking in Chinese so I couldn’t even understand what they were saying. However I did hear the Chinese word for ‘but’ used quite a lot…… so I’m presuming that’s bad. I think Open Doors are one of the hardest things to deal with. You may have great students, you may have a well planned lesson, but once the students notice their parents are there, you honestly don’t know how they will react. They could become extremely energetic and show their parents how good they are, or they could clam up and realise ‘oh no, my mother’s here. I’m afraid in case my English is wrong. Best if I don’t say anything at all’….and that’s what will happen, they just won’t say anything; which ultimately happened my 2 students. And yay, I have another Open Door on Sunday with two girls. These are usually really well behaved and they speak good English, but you never know. And another sad note, my favourite class is being moved to another teacher. I’m so sad. That was one class I didn’t mind teaching at all. I actually enjoyed going into that class. They were also MY students, whereas a lot of my other groups were passed down to me because of teachers leaving. This meant I could see their English improving from me, and I could see their English level getting better compared to their first class. The reason for this is because the parents wanted a male teacher from the start, but at the time only I was available. Now that there is a new male teacher available they are going to try it out with him. My students are going to have to work really hard if they want to become my new favourites. All By Myself… Don’t Wanna Be, All By Myself…. 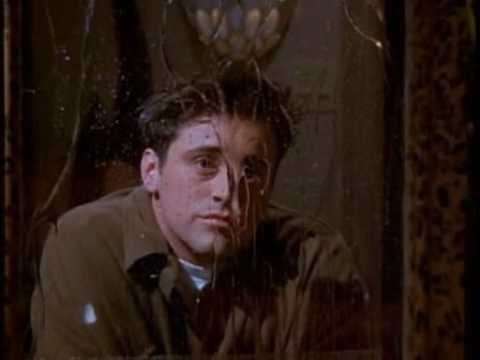 Joey from Friends, all by himself. Happy Birthday to my blog! One years old! I can’t believe I’ve been blogging for that length of time. I never thought I would have still been writing in it. You see many blogs that slowly wither away, turning into dormant blogs, hoping that one day they might come back to life. I thought mine would go down that route, that I would become too busy to write in it. But no, thankfully I’ve stuck to it, prioritising a time to it every week. But what a year makes! That girl from one year ago has surely grown up a bit. She had to heart-breakingly walk away from people she loved to get to where she is now. But thinking back, it has been the right decision. Everything has changed. “Ok Aisling, you’re going to go to China and leave your family, boyfriend and friends’ behind. You’re going to live in Chengdu by yourself. You’ll have your own apartment, but you’ll have to pay for everything yourself, and you won’t be able to ask your family to help you. You’ll have to get your own food, work a full time job, and have 2 days off a week, like regular working people. Oh, you will also have to get yourself up at 7:30am, no asking Mum or Dad to get you up. No one will bring you tea in bed either. Seriously though, that would have put me off living abroad. But thankfully, I kind of erased those parts from my head, ignoring them in a way. I don’t want to think that I wouldn’t get tea in bed from my lovely parents, no one will cook my food for me. That I, of all people, will have to get MYSELF up for work. That jobs for Mum and Dad. As goes for making me food, washing my clothes, and generally keeping me alive and presentable to others. I have to do ALL THAT…. By MYSELF?! That’s a big ask. But when your thrown in by yourself, you have to do it. Simple as. I learned that. Now….. I have to go wash my dishes… they’ve been decomposing a week now.